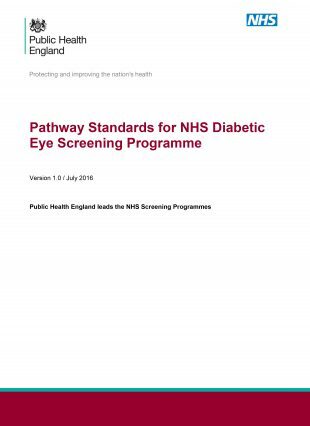 We have published the revised national pathway standards for the NHS Diabetic Eye Screening Programme. These standards will come into effect from 1 April 2017 and some will result in operational changes. We will issue guidance to providers and commissioners in due course to support these changes. We are also working with the software suppliers to ensure providers can report accurately on the information required. In revising the standards, we have consulted widely with local providers, commissioners and other stakeholders. The standards measure important points in the screening journey, including coverage, uptake, timeliness of results, quality of screening images, timeliness of referral and timeliness of treatment. They will help improve quality and consistency by ensuring providers work to the same common pathway, use the same definitions and the same comparable information. The screening quality assurance service (SQAS) and commissioners use national standards to ensure local programmes are safe and effective. Programmes will be able to monitor changes in performance throughout the year through quarterly reporting. This will enable them to evaluate the impact of any interventions to improve performance, such as measures aimed at increasing uptake.